I rarely I find my self in the city of Manila. So when the opportunity to explore the flavors of the oldest part of the city presents itself, I grab it. Sadly, I’m in between meetings and I only have time for a cup of coffee and a couple of desserts. I’m fine with that. Besides as a friend of mine would say, dessert should always come first. I’m headed to Robinson’s Manila and a little place called MoMo Food+Drink. Brought to you by the same people who created M Café, MoMo is corner café in the new wing of the mall. With its high exposed ceiling and wall-to-wall glass windows, this eatery exudes a New Yorkesque, lofty feel–a stand out in Manila’s urban jungle. MoMo Food+Drink reminds me of something. I look at the menu on the wall and I realize it feels like Chelsea Café and Market–an array of comfort foods: brunch items, pastas, pizzas, sandwich, hot and cold drinks. We order two desserts. The first is a play on a favorite of mine. Momo’s Smore Bar (P55) is breakdown of an American campsite snack. 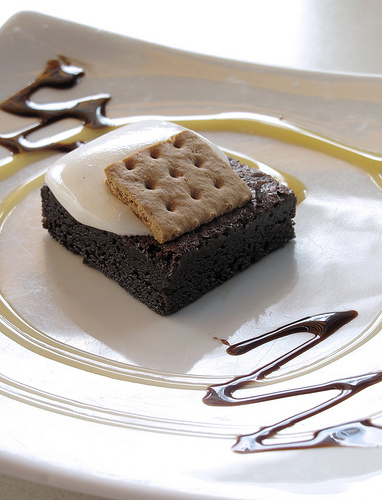 A chocolate brownie is topped with a viscous marshmallow sauce then finished with a tiny graham cracker square. This dessert excites me but something is lost in translation. All classic flavors are all there but once you bite into the bar ,it becomes layers upon layers of soft. A Smorish mush. The Chocolate Chip Cookie Dough Cheesecake (P115) was thankfully another story. The only thing I love more than a Chocolate Chip Cookie is a large scoop of Chocolate Chip Cookie Dough Ice Cream and this dessert is as close to that one can get. Shaped like a lovely, oversized cookie sandwich, this cheesecake’s tastes deliver on its visual promise. Light, lovingly layered in flavors yet straightforward and scrumptious, I could have eaten two more by myself. A hit and a miss. Yet my experience at MoMo Food+Drink was like a relaxing oasis in a sea of concrete. Would I return? Absolutely. I’m looking forward to getting stuck in Manila again. The cheesecake looks stunning. Yum!!! I used to love MoMo! But quality of service declined, serving sizes became smaller, prices went up, and the quality of the food was inconsistent. I haven't been there in two months, but there was a time I could eat there everyday. 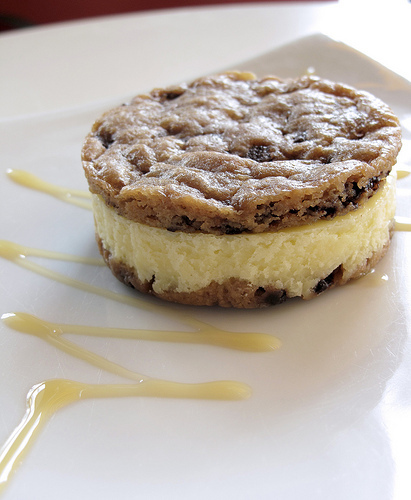 I, too, super <3 the Chocolate Chip Cookie Dough Cheesecake. Momo is usually crowded when I come (maybe I'mjust unlucky) but this little thing is worth beating the crowd for. That and the battered fish sandwich (fish and chips sandwich?). I went there today after 2-3 months and I guess I wasn't really disappointed with what I ordered (It was cookie dough sheesecake but not similar to the one pictured) but it's still not the same as it used to be. i loooove sweets, i bet im gonna love this dessert.